This book frustrated me. I once had the fortune of seeing Sandro give a talk at the Software Craftsmanship North America (SCNA) conference in 2013, and found his talk uplifting, and inspirational. As a result of that, when I saw this book had been released it was an "instant buy" for me. Ultimately though I was incredibly disappointed by this book. I wanted to like this book. Rather I wanted to love this book. And honestly, much of what Sandro espouses in this book I agree with and believe. But, this book is poorly written and filled with anecdotal "evidence" to support his claims. This is a shame, as there is much well documented, well-researched evidence to support much of what he argues for. See, the thing is when you make empirical claims (ie - if you do TDD you will reduce bugs and therefore reduce costs, or if you pair with other developers you will create a culture of learning which will improve productivity, or if you hire craftsmen your company will be better off), you need to back that up with empirical evidence, not just "I had this job once where we did this & it worked...". 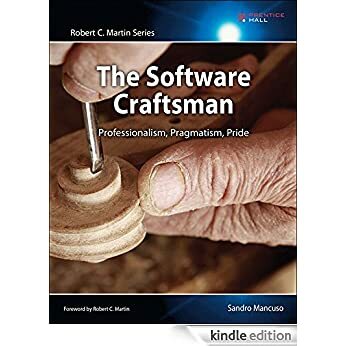 By in large if you've ever followed the software craftsmanship community, you'll have heard everything that you'll read in this book. TDD is great so it's an encouraged practice, but we don't hold practices in a dogmatic way. Pragmatism is key. You can't be a great developer without being passionate. Commit yourself to lifelong learning. The craftsmanship movement is about raising the bar. On and on and on, it's all the standard tropes you hear in conversations about software craftsmanship. I went into this book expecting to see something new, or some deep insights, instead I got a series of blog posts that felt very much like preaching to the choir. There's also lots of heavy-handed "preachyness" in this book. Lots of defamatory comments towards managers, agile coaches, and architects (though back-pedalled in the appendix), and lots of "if you don't do this, then you're doing it wrong" type rhetoric, which I found surprising. The craftsmanship community is supposed to be about celebrating diversity and being welcoming of anyone, of any skill level so long as they're willing to better themselves and learn more. There's also lots of inflammatory/adversarial commentary (ex: "QA teams are an anti-pattern", "are you good enough to work on legacy code? ", "tech debt items are an excuse to justify bad code", "software craftsmen are never scared to lose their jobs", "only incompetent people fear losing their jobs", "university degrees don't mean anything", etc) that feels very elitist & arrogant. Lots of straw man commentary, painting conversations with Dilbert-esque pointy-haired bosses in a very biased light. Lots of sweeping generalizations, and little in the way of new insights. There's a lack of focus or coherent theme to the book. Who is this for? Is it for "apprentice" craftsmen? For people who've heard about this software craftsmanship thing and want to know more? For the Bob Martin's of the world? It's so inconsistent, some of it feels written for an audience who's only vaguely familiar with the craftsmanship movement, and other parts feel like unless you've been writing code for decades you'll have trouble relating. I'm being overly harsh, there are nuggets of really good insights in this book and he certainly knows the craftsmanship movement. The thing is though there's nothing you won't get from simply reading the blogs or books of some of the people in the craftsmanship community. If you've read Clean Coder by Bob Martin, there's no reason to read this book.